Today, almost 60% of Americans don’t use a budget to keep track of their finances, and most of them choose not to because creating and maintaining a budget seems too difficult or time-consuming. They might be aware of how crucial a budget is for any long-term financial goal, such as saving for retirement or planning for the newest addition to the family, but somehow the idea of making one is just too intimidating or burdensome. The truth is that in today’s day and age, having a budget can be just as simple as making a shopping list or keeping a weekly calendar. First of all, budgeting apps are making it easier than ever to build a budget and actively keep track of your finances. These apps are highly customizable, often free-of-charge, and they cater specifically to people who don’t have the time to do financial record-keeping on their own time. But if you want more agency in building a budget, and you have a spare hour or two, then you shouldn’t be the least bit afraid of making an old-fashioned spreadsheet for yourself. 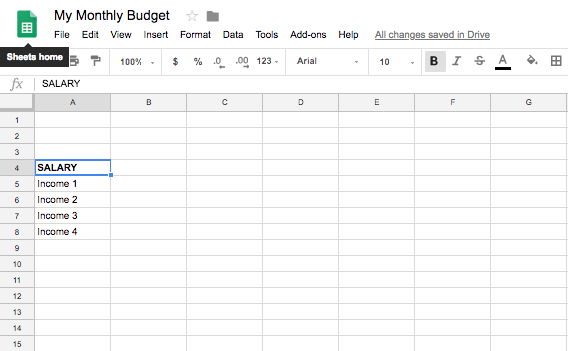 Google Sheets makes it as easy as possible to construct a budget, even for someone who has no experience making spreadsheets. 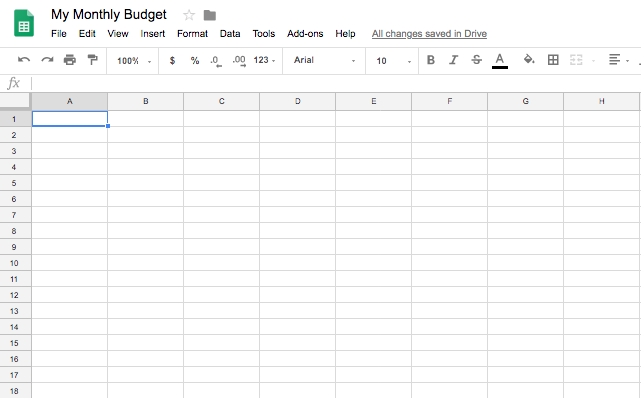 In this step-by-step article, we’ll show you how to create your own budget template in less than 30 minutes on Google Sheets. 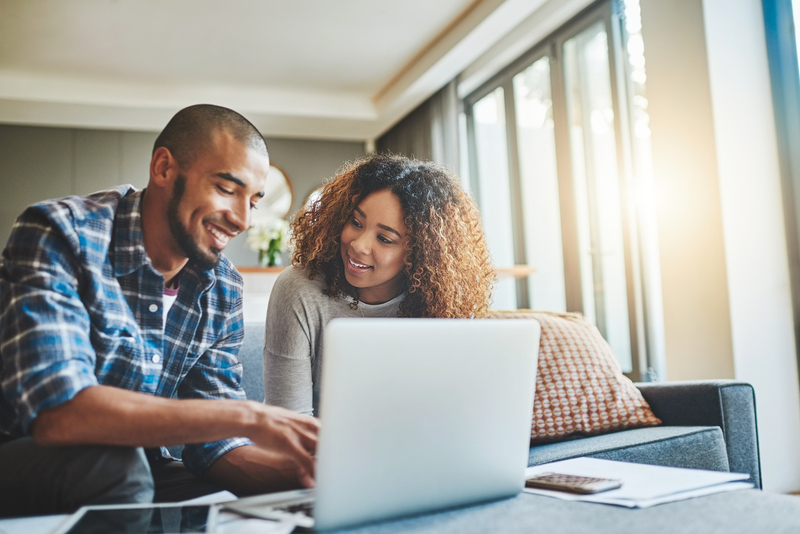 With this template, you’ll have the opportunity to review your finances on a month-to-month basis and make sure that you’re putting the right amount into your savings and retirement accounts. As your earnings and expenses change over time, you can update the figures in the template to reflect the recent developments in your life, and the spreadsheet will automatically adjust to those changes. Keeping all of your essential financial information–from movies to the mortgage–in this one document will prove useful time and again, as you strive to save money and plan for the future. Create a new Google Sheet and give it a title. Create your first column, labeled “SALARY,” and list out every source of income you receive. In the column directly to the right, enter in the corresponding amounts you earn from each income source. If your earnings fluctuate on a weekly or monthly basis, try to be conservative with your estimates and always make sure to subtract tax first. This way, you won’t have to worry about any unpleasant surprises. At the bottom of the first column, label a cell with “TOTAL”–this will indicate that the cell directly to its right represents your total income for the month. Now you’re going to create the budget’s first formula. Select the cell directly to the right of “TOTAL” and click on the Functions icon. A drop-down menu will appear, and you’ll want to click on SUM. Once you’ve selected the SUM option, you’ll see a function pop up in the cell you’ve selected. You’ll want to click the figure for Income 1 and SHIFT-CLICK (hold shift while clicking) your last income–this will automatically highlight every one of your income figures for you. Next, you simply press enter, and your total monthly income will appear next to the cell labeled TOTAL. Before moving to the expense section of your budget, it’s vital that you set aside some money for the future. Ideally, you’ll put one portion of your income into your savings account, another into your retirement fund (in this example, a Roth IRA), and you’ll keep a bit of your budget left over in case you’ve miscalculated–let’s call this a safety net. Each of these accounts should be assigned a specific percentage. You can now enter these percentages into your budget, so that you don’t have to make calculations whenever your income changes. Click on the cell where you want to see the figure, and hit the “=” sign–this will tell Google that you intend to create a formula. Now, you’ll click on the cell that has your total income, and press the “*” key, which is what Google uses to multiply. Finally, you’ll enter in the percentage of your total income that you’d like to devote to this specific account–for Savings, which is 20% of the income, you’ll multiply by .2 to get your answer. Press enter and…voila! You’ll know exactly how much to set aside this month for your savings account. When your earnings change in the future, your spreadsheet will automatically adjust your savings according to your new income. You can proceed to repeat this for any other savings accounts you might have. Then, you’ll want to create a “Total Savings” cell, which can be created using the same steps you followed to make the Total Income cell in Step 6. Now, you’ll want to figure out how much money you have left over for your everyday expenses. Make a cell titled “Remaining Total” and in the cell next to it, create a formula by doing the following: Press “=,” click on the cell that shows your total income, then press the minus symbol, and then click the number that represents your total savings. Press enter, and the amount of money you have at your disposal for the month will come up. It’s now time to list all of your monthly expenses, from insurance to electricity bills. If you’re not sure how much you spend in a specific area, take a look at your most recent bank statement to give yourself a clearer idea. If you’ve got the time, it’s a great idea to look at the past six months of bank statements, so that you can more accurately assess how much you spend on average. You’ll now want to follow Step 6 again, but this time you’ll use it to add up your expenses. You’ll finish by creating a cell which will tell you the difference between your projected income and expenses. Label a cell “Total Leftover” and subtract your “total expenses” from your “remaining total” using the steps mapped out in Step 9. Hopefully, you’ll come up with a positive number. If your Total Leftover is negative, you might want to think about making some financial adjustments, like stopping lifestyle creep.